It is December 18, 2018 and this is a recipe update. As I stated when I posted this recipe I planned to eliminate the yoke of the egg because of it high cholesterol content. Well, I did. I made a 6 inch cake pan of corn bread, and the results were great. I added the two fresh egg whites, increased the sugar from 1/2 teaspoon to 3/4 teaspoon, and instead of spraying the pan I used, some Crisco shortening, which helped prevent sticking more than just spraying with cooking spray. As great as I experience with air frying has been to date, I can truthfully say that air frying is not 100% oil-free. However, there is a measurable decease in the amount of oil you do use, and for those foods that have high amounts oil in them already, unless you are breading them, such as with chicken, steak and other high fat meats, you do not need to apply oil at all. Therefore, I highly recommend air frying, and I am loving converting our favorites to air frying and finding recipes for some of the more common foods eaten regularly. Today we are having my concoction of navy and black bean soup with white rice. However, today's recipe is about corn muffins. 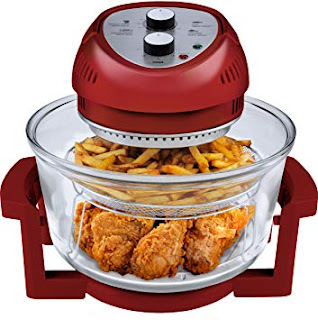 In my first post about air frying I mentioned that I would be converting as many of my regular and deep fried recipes into air fried. In addition, we are having muffins made with sweet rice milk instead of cow's milk. This recipe also goes with my renal diet plan. Well, I don’t really have a concrete plan, I just omit or limit the amounts of foods and meats that I know would in high quantities negatively contributes to my high blood pressure and kidney function. I am basely an on the fly cooker who uses some thought into what I am eating. 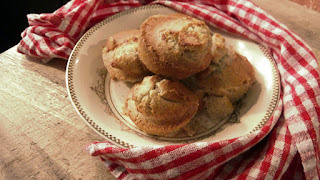 The recipe is for 6 muffins and in my Big Boss Air Fryer I have no problem baking these muffins. Greased muffin pan well enough so that the muffins will not stick in it. Set aside. In a medium size bowl mix the corn meal mix with the sugar. Then mixture all of the ingredients together in the medium bowl. Then pour the muffin batter into the well greased muffin pan. Air fry at 320 degrees for 12 minutes. There you have it. If you are like me and have to be actively aware of what and how much you eat, try this recipe with some unsalted butter or margarine and your next pot of beans, greens and spring green beans. Your family will not believe that these muffins were air fried. The next time that I make these muffins I will try baking them with 2 egg white instead of the one whole egg. If doing this turns out well, then that will reduce the cholesterol contained in the muffins. Why hesitate? Download the recipe. When cooking very hard dry beans, instead of soaking for 8 hours or overnight, try this. After cleaning the beans, microwave them in a medium size plastic mixing bowl for 30 to 40 minutes covered with a vented lid until the beans are partially soften. Then add the beans and four cups of the hot water from the microwave bowl to the pot with your other ingredients and cook as usual. This method also working with cooking fresh carrots for pot roast and stews. However for stews and soups, microwave the carrots for 25 minutes on high, then add the water from the bowl the carrots were cooked in to the pot. With squash microwave for 5 minutes, and then cut lengthwise to remove seeds and/or skin for further cooking. .